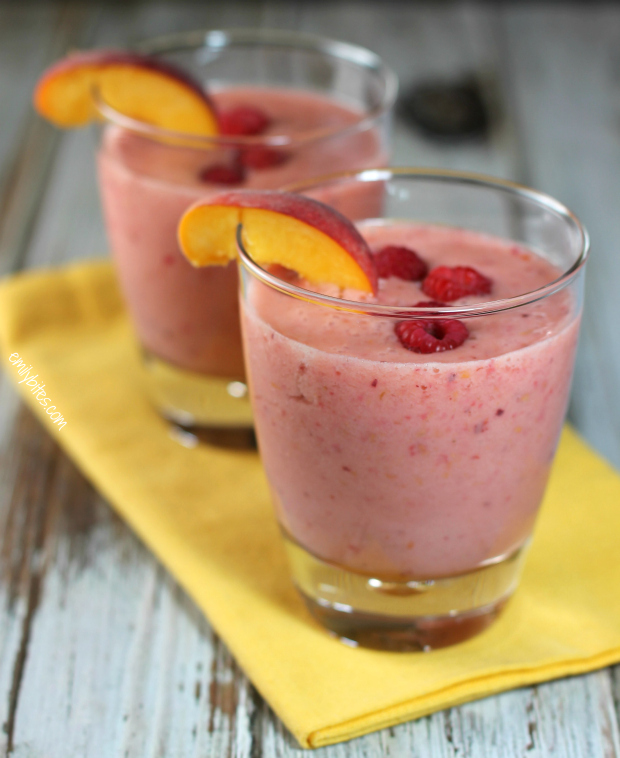 Ahhh, this Raspberry Peach Tea Smoothie tastes so fresh, fruity, clean and refreshing it’s like having a glass full of Farmer’s Market for breakfast. With only four ingredients (plus ice) it’s incredibly simple, but the natural sweetness of the ripe peaches and raspberries, the fresh brewed flavor of the iced tea and the creamy Vanilla yogurt combine for a bright, pure, lightly sweet flavor you won’t be able to resist. Plus, it blends in less than 30 seconds and the only prep time is cutting the peach in half to remove the pit – that’s exactly how much work I want to put into making breakfast on a weekday! 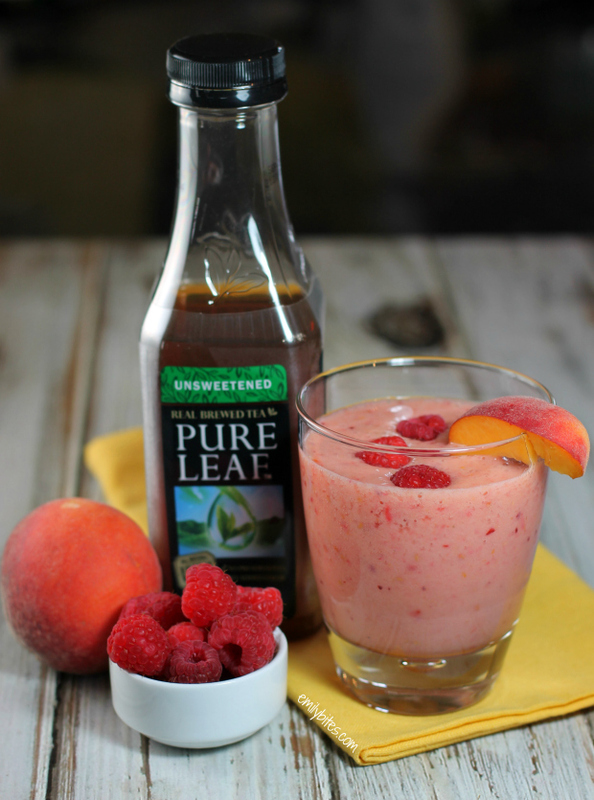 If you caught the Lemon Pepper Iced Tea Chicken recipe I made back in June, you probably know that I’ve partnered with Pure Leaf Iced Tea this Summer to come up with some tasty recipes using one of my all-time favorite beverages. So far, both recipes have become instant favorites I know we’ll make again and again. I’m thrilled to be working with an ingredient that has such an authentic, fresh brewed flavor (no surprise there, it’s brewed from fresh tea leaves) – it has been great cooking inspiration! One of the other reasons I’m excited to partner with Pure Leaf this Summer is their work with Wholesome Wave. Wholesome Wave is a nonprofit organization with a mission to increase access to (and affordability of) fresh, locally grown food through programs that work with neighborhood farmer’s markets and encourage those in under-served communities to make healthier choices and buy local produce. Through their “Share the Love of Leaves” campaign, Pure Leaf has already donated $100,000 to assist Wholesome Wave with their efforts, and you can help them to donate more! For every “share,” “like,” or comment on their Facebook or Tumblr pages, or use of the #loveofleaves on Twitter and Instagram, Pure Leaf will donate an additional dollar to the cause, up to another $50,000. That means you can help Wholesome Wave fulfill their mission just by following those links and hitting “like” – how easy is that? If Pure Leaf reaches their goal of a full $150,000 donation it will help Wholesome Wave provide 100,000 pounds of fresh, local grown fruits and vegetables in communities all across the country. That’s worth a “like” isn’t it? I’ve made some tasty smoothies in the past (for more, check out my Drinks & Smoothies category in the recipe section), but I can honestly say this is my favorite one yet. 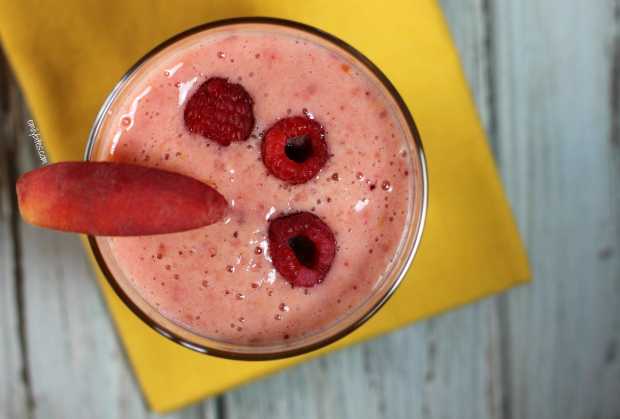 The entire recipe yields around 2 cups of smoothie, which I split into 2 (1 cup) servings, but feel free to down the whole thing if you want – the entire recipe is only 130 calories! *I have partnered with Pure Leaf as part of their 2014 “Share the Love of Leaves” campaign. I have been compensated for my time commitment to work with their product, however my opinions are entirely my own and I have not been paid to publish positive comments. Want more from Pure Leaf? Follow them on Facebook, Tumblr, Twitter, Instagram or Pinterest! Combine all ingredients in a blender and blend until smooth and well combined. Recipe yields 2 cups. I never would have thought to add tea to a smoothie! I need to buy the ingredients for this, then will give it a try. Looks good! Finally made this, but substituted strawberries for the raspberries. Turned out great. I’ll definitely give the raspberries a try too. Thanks for the idea to use the tea! Made this again today with the raspberries, and it was even better! I am sorry this is off the subject, but I need to know where to get wonton wrappers. Thank you for all the yummies.